YCAN’s riverside event with the Yarra Riverkeeper was informative and inspiring. Here is YCAN member Ewan’s review. 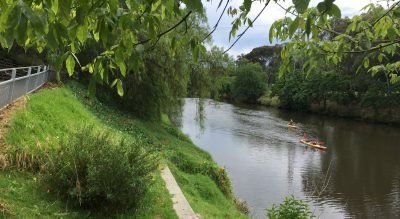 The Yarra and Climate Resilience: Safeguarding our City and the Yarra Valley On the 28 Feb, YCAN hosted this event at the Fairfield Amphitheatre with Andrew Kelly, the Yarra Riverkeeper. In a wide-ranging presentation, Andrew reminded us all just how significant the Yarra River is for the city. The forested upper reaches of the river – the source of most of the city’s precious, high-quality drinking water – are in good condition, but water quality declines downstream because of agricultural and urban run-off. About 21 per cent of the catchment retains its natural vegetation, 57 per cent is agricultural and 22 per cent is urbanised. (All figures extracted from the excellent Yarra Riverkeeper Association website. Andrew was particularly pleased with the passing of the Yarra River Protection (Wilip-gin Birrarung murron) Act 2017; the Bill was passed unopposed and took effect on the 1 Dec 2017. In Andrew’s words: The Bill requires a Yarra Strategy Plan to be commissioned (from Melbourne Water as the lead agency) and this plan begins with building a 50-year community vision for our river … it includes traditional owner ‘caring for country’ management for our river in an urban context. The planned NE Link road project (a six-lane connection between the Eastern Freeway and the M80 Ring Road) between Bulleen and Greensborough, passes just metres from the Bolin Bolin Billabong, a highly sacred site to the Wurundjeri people. Great ceremonies were held there between April and May with more than 1,000 people attending … Wetlands like the Bolin Bolin Billabong are incredibly important to the health of the landscape. More information available here and here. Given that underground tunnelling for the NE Link will be required adjacent to this Billabong, the Wurundjeri people must be wondering how this route for the Link could ever have been justified. Andrew also highlighted the need to address other problems associated with our expanding city; these problems included the litter accumulating in our waterways, and the damage caused by intense (off-track) bike use in the Yarra Environs. In conclusion, this event was a most important reminder of the need for groups like the Yarra Riverkeeper Association, and for effective advocates for this significant resource; thank you Andrew. YCAN acknowledges that funding was received from the City of Yarra, and that the event was part of the National Sustainable Living Festival 2018. Tell the Victorian Government you oppose the NE Link on the grounds of its proximity to area of significance for the Wurundjeri. Contact the City of Yarra and tell them they must bring forward the construction of Gross Litter Traps in the municipality, to reduce the amount of litter entering our waterways.